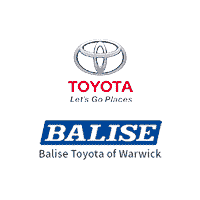 Thank you for considering Balise Toyota of Warwick for your new Toyota vehicle purchase. We are proud to serve our neighbors and friends visiting from the Warwick, Providence and Pawtucket communities. If you are searching for a new Toyota car, truck or SUV to get you to your 9-to-5 or travel off the beaten trails, Balise Toyota of Warwick is your one-stop shop. Our online inventory is always up-to-date and readily available to browse, so feel free to search through our selection. Once you see a Toyota car or SUV you like, please reach out to us to schedule your test drive. We can’t wait to meet you soon! We have a collection of new Toyota Camry, Corolla and Avalon models that are worth a look. If you are on the hunt for an SUV that the family won’t outgrow, we carry the Toyota Sequoia, 4Runner and RAV4. If fuel efficiency happens to be at the top of your list, we also carry the Toyota Prius – one of the most recognizable hybrids you can find. Not only do we provide our North Kingstown, Coventry, Cranston and other New England drivers a large variety of cars, but we also provide outstanding customer service. In other words, we are committed to ensuring you have a top-notch shopping experience from the moment you step foot on our showroom floor. For more information about any of the Toyota cars you see in our inventory, or if you would like to learn more about your financing or leasing options, please feel free to contact the consultants here at Balise Toyota of Warwick, or stop by for a visit. Thank you for choosing Balise Toyota of Warwick as your preferred Rhode Island Toyota dealer. The Toyota 4Runner is one SUV you’re going to have to see in person. For over 30 years, its proven body-on-frame construction has helped it master the off-road. With available Crawl Control (CRAWL) and Multi-terrain Select, you can push performance to the limits. If you’re looking for a sedan with sophistication, the Toyota Avalon is for you. On the outside, the dramatic front grille will turn heads wherever you go. It also features available Apple Watch® and Android™ smartwatch compatibility. A couple of things that make the Toyota C-HR stand out are its unique styling and color options. Plus, with the standard Toyota Safety Sense™ P (TSS-P) technology suite, you and your passengers will always be well-protected. The Toyota Camry is a popular sedan, and it is even available in a hybrid version. Inside, you will discover sporty styling thanks to the available leather-trimmed 8-way power-adjustable driver’s and front passenger seat. The new Toyota Corolla is an excellent choice for first-time car buyers. With the available 7-inch touchscreen display with the available Entune™ Audio Plus system, you will always stay entertained on long road trips. Our new Highlander models allow Pawtucket and North Kingstown drivers to explore every possibility. When you take a seat inside, there is seating for up to eight, five USB ports around the cabin, and more than enough cargo space. Not only is the Toyota Land Cruiser loaded with 60 years of history, but it is also the perfect off-road companion. When equipped with the 5.7L V8 engine, 8-speed transmission, you won’t have any issues taking your vehicle on the trails. The Prius comes with a double-wishbone style multi-link rear suspension that provides this hybrid with excellent power and handling. Its interior features a modern seat design and an available 11.6-inch multimedia display. If you’re taking a weekend trip around Coventry or Cranston, we think you’re going to want the Toyota RAV4 by your side. New models come with 18-inch 5-spoke Black alloy wheels, durable rocker panel guards and integrated black roof rails. Families around the Warwick and Providence areas are going to want to purchase or lease a new Toyota Sequoia. The robust 5.7L V8 engine and the available Multi-Mode 4WD system makes every drive a little more enjoyable. The new Toyota Sienna is another vehicle that is ideal for families. This minivan features a Split & Stow 3rd Row™ seat that has enough room for passengers and extra cargo. Add on the available Dual-View Blu-ray Disc™ Entertainment Center to keep the kids entertained for hours. The Toyota Tacoma is powered by a 2.7-liter 4-cylinder engine that delivers 159 horsepower and 180 pound-feet of torque. If you’re taking this truck off-roading, we suggest upgrading to the Tacoma TRD Pro. The available TRD Sport Package features aggressive styling and 20-inch alloy wheels. With its available deck rail system, easy lower and lift tailgate, and an available 10,200-pound towing capacity, the Tundra is ready for any task. Subcompact sedan shoppers should look no further than the Toyota Yaris iA. Each model comes equipped with Standard Bluetooth® wireless technology and a 7-inch touchscreen display with available navigation.